The 2013 SVBC Harrisonburg Business Bicycle Rack Grant Program is up and running! See our bike rack grant page for details. Why Is Bicycle Parking Important? Bicycle parking is good for business. 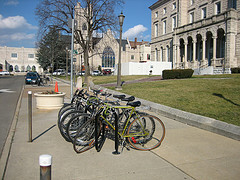 Bicycle racks provide additional parking spaces which customers can use to patronize local businesses. Bicycle racks not only invite cyclists in, but they announce to potential cyclists and non-cyclist customers alike that the business supports sustainable values, an increasingly important factor for many consumers. It presents a more orderly appearance for buildings. It prevents damage to trees and street furniture. It keeps bicycles from falling over and blocking the sidewalk. 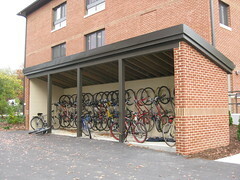 Bicycle parking helps legitimize cycling as a transportation mode by providing parking opportunities equal to motorized vehicles. Source: Association of Pedestrian and Bicycle Professionals. Bicycle Parking Guidelines, 2nd Edition. 2010. How Can Bicycle Racks Help Boost Worker Productivity? Employers encouraging employees to bicycle to work is one of the best ways to get people back on their bikes. Here are some ideas from the League of American Bicyclists: Encourage Businesses and Employers. What Makes a Good Bicycle Rack? Supports the bicycle in at least two places (not just one wheel), preventing it from falling over. Allows locking of the frame and one or both wheels with a U-lock. Is securely anchored to ground. Resists cutting, rusting and bending or deformation. SVBC discourages the use of the undulating or wave style bike racks, the comb style bike racks, the wheel well and other bike racks that do not meet the recommendations of APBP listed above. How Much Do Bicycle Racks Cost? The cost of bicycle racks vary depending on style, number of bikes it can accommodate, if a special color is desired, shipping distance, and if more than one bicycle rack is being ordered at a time. Below is a list of different inverted U bicycle racks and a range we have found them to cost. Search online for Bicycle Racks. * SVBC provides these resources as a public service. SVBC does not endorse any of the products, vendors, consultants, or documentation referenced. Any mention of vendors, products, or services is for informational purposes only.